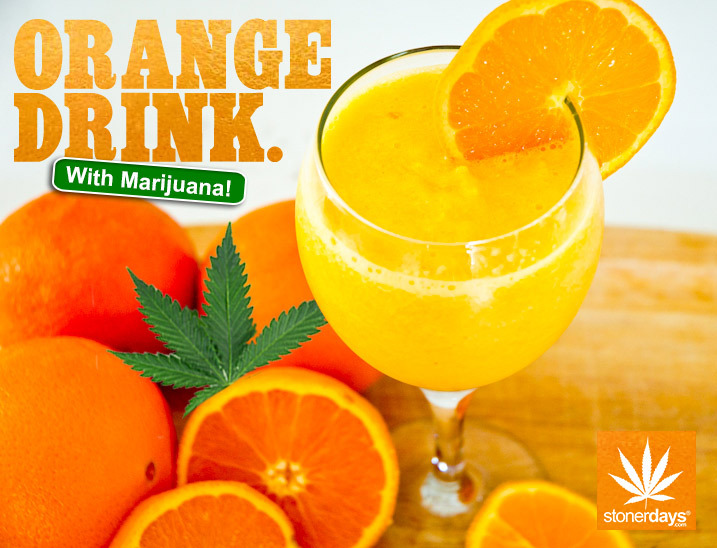 Nobody can deny that the combination of kush and OJ is the perfect way to start your day. Not everyone is a coffee drinker, after all. Plus, orange juice is better for you anyway. The following recipe will allow you to create an awesome orange drink that you can bring with you on a hot day as a nice medicated smoothie or you can drink it with your bowl of cereal as an awesome wake and bake. Whatever you choose to do, this drink is absolutely amazing… And medicated. This recipe will make 1 cup of delicious orange drink and a serving size is also 1 cup! If you’d like to make more or less of this drink, you can double or even triple the recipe to share it with your friends. Take the orange juice concentrate, kief/hash, milk, vanilla, and sugar in to a blender. Puree the mixture until it is smooth, with a bit of froth at the top. Gradually add in the ice cubes, continuing to puree in the blender. The drink should be a smoothie like consistence, thick but not like ice cream thick. Pour in to a container and serve. Remember, the amount of kief/hash given is only an estimate. You can use more or less depending on your tolerance and personal preference. Please also remember that ingesting marijuana this way effects people differently than others and if new to edible cannabis, try smaller amounts and gradually increase as you know how it effects you. This entry was posted in Stoner Cookbook and tagged stoner cookbook.